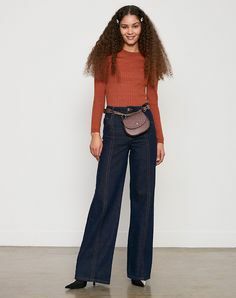 Flared jeans are back, and you can thank the return of the '70s trend. Combine them with a simple ribbed knit to channel icons of the era like Farrah Fawcett and Jane Birkin. To update it for now, reach for this season’s version of the fanny pack and cute embellished hair clips. You can file this one under work-to-weekend wins.